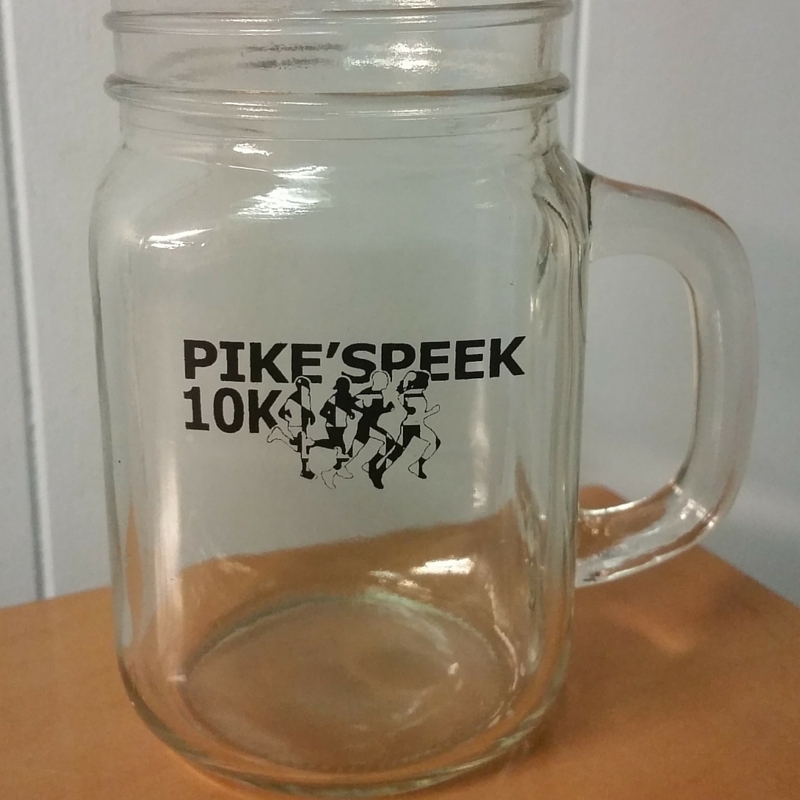 Race Recap: Pike's Peek 10k + A GIVEAWAY! 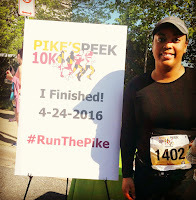 One of my running resolutions for 2016 is to write my race recaps quicker. I tried to give myself a deadline of a week per race, but obviously I didn't hit that mark like I'd planned. I have three race recaps to complete before my June 4 half marathon, so I apologize in advance for the multiple race recap posts you'll be seeing over the next two weeks! Pike's Peek is a pretty popular race here in Montgomery County, Maryland. It's a 10k down a normally-busy main road, running from north to south, passing a few Metro stations along the way, as we run from the Shady Grove Metro to the White Flint Metro. 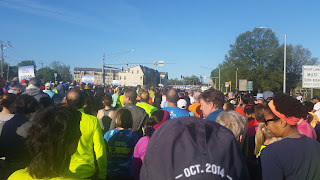 It's hosted by the Montgomery County Road Runners, of which I am a new member. 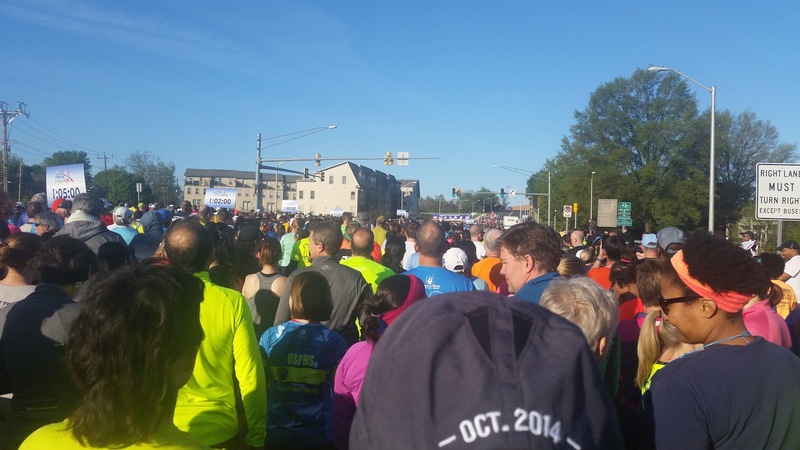 There were about 3,000 runners who participated in the race on April, which is a pretty good amount! The weather was absolutely gorgeous, sunny, and not too hot -- especially since you're running on a road with no tree coverage to protect you. The crowd at the start line. What a beautiful day! Okay, so enough about my technology! Let me get on to the race recap! I went to packet pickup the day before the race. I don't really like day-of pickup. I don't trust myself to wake up on time, and I want to make sure everything goes smoothly the day of the race. The only time I'll do day-of pickup is if that's the only option. Seriously! If I am traveling for a race, I'm getting there before the race, so I'm going to pick up my bib then. I think the last time I did day-of packet pickup was maybe for the Ragnar Relay in October, but I can't remember another recent race when I did this. The timing chip I wore, which gets returned at the finish line. I already said that the weather was perfect for this race, which is so sad to say now that it's been raining ever since. :-| I just had to say it again because I've been fantasizing about this day ever since. I miss you, dearest Sun! This race is considered a PR race, I think mainly because it's pretty flat; however, and this is a big however, it is not as flat as many people make it out to be. Sure, it's not hilly. I would definitely not call this race flat. I would say that the whole, "there's a hill at the beginning, but that's it," phrase that I'd heard people repeat before the race was just not true. I drive Rockville Pike every day, and I know exactly where the hills are. It's just false that there is only one hill on the whole 6-mile stretch. Dear People Who Keep Saying That: Please stop! I was totally unprepared for this race, so I was not upset that there were not more hills. I actually forgot about the race until I received a reminder about it several days before the race. When I opened that email, I thought: F. Needless to say, I ran a slower-than-usual 10k. BUT, I FINISHED! The finish line was interesting. They didn't hand out medals at this race (which I'd totally forgotten, as I did the race itself). Instead, we received this cute mason jar mugs. Now, I'll be honest: I have absolutely no idea what I'm supposed to do with it. If you guys have suggestions, please share them in the comments! At the finish line, after receiving your mason jar, you return your chip (they had chairs set up where you could sit to take them off. This was great for a clumsy person like me who might fall over from the thought of even trying to unlace my shoes! ), and you're off to the food! They had a lot of different food options, courtesy of Mamma Lucia. I've reached the following conclusion when it comes to eating after a race: I will eat just about anything/everything. I'm not a big fan of Mamma Lucia's (it's fine), but the egg casserole thing they had, along with the sauteed onions and peppers was ON. POINT. 10/10 would eat again. And again. What does this matter, you ask? Well, it appeared that quite a few people missed out on this detail, and were totally unprepared when they finished the race. I saw a bunch of people walking back to the start line, which is no bueno. I sat down to eat my yummy food, and a lady was next to me and asked about how we were supposed to get back to the start line. I explained everything to her, and she was totally bummed. She didn't have money or anything for transportation. Earlier that morning, something told me to stick my extra Metro cards in my running belt, which I did, along with money and my ID. She was in luck! I let her use one of my extra cards, and we chatted the whole way back. Fast friends! I'll tell you more about my new running friend Terri in my next race recap, so stay tuned! But now, on to the giveaway! Like I said, I love my Milestone Pod. Love. And because I love it, and tweeted my love, they were nice enough to send me a Pod to give to one of you! Yay! 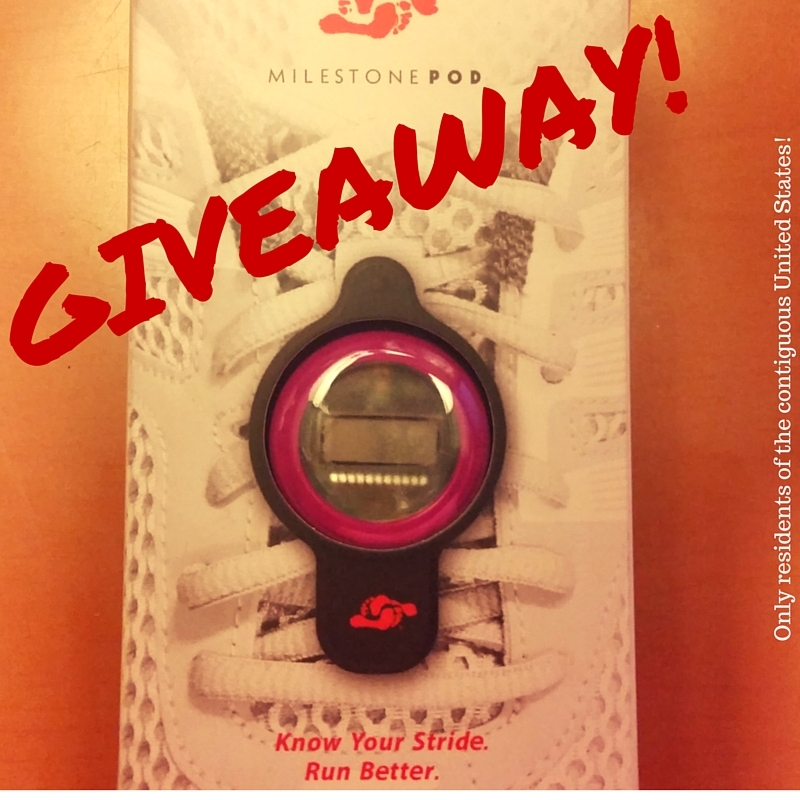 Thanks to Milestone Pod, I'm giving away one pink Milestone Pod! I'm totally jealous, by the way, because I have a black one, and this fuchsia-ish one is so much cuter! How do you enter the giveaway? Kindly enter your information into the Rafflecopter widget below so we can get this party started! Good luck! Note: Only residents of the contiguous United States are eligible for this giveaway. Sorry, international friends! Since I'm posting this on a Wednesday, I decided to join Running With SD Mom and Erica Finds as part of their Wednesday Giveaway Roundup! Check out their pages to see what other cool items you can enter to win! I think this would be an extra help for when I start marathon training in July! It tracks your SHOE LIFE? I KNOW, without a shadow of a doubt, that I tend to use my shoes way past their shoe life, and something to actually remind me that I NEED new shoes, for my feet's sake, would be SO helpful! (Okay, I really need it to NAG me, call me names, drag me to the shoe store, but anything that could be interpreted as "Hey, fool, can't you tell your feet hurt even more than they always do? Buy new shoes already!" would be wonderful! I think this would be an extra help for my walking. I'm running a marathon on Saturday and it's my birthday on Tuesday :) This would come in handy! You can drink out of your jar or use it as pencil holder or hang it on your metal rack or put kitchen utensils in it... So many things you can do with a mug! Also, I'm the total opposite of you - I hate races that require you to come to an expo to pick up a packet. If much rather pick it up race morning and put it in my trunk! I always double check and won't sign up if it requires me to pick up before race day! Id love to use this for my walking. This is great for training purposes and everyday use for fitness. I am actually training now and this would really help. I'm gonna do a couple 5k's this summer. Thank you. I have a friend to run with this gonna be a perfect gift for her. It's pink? I would want to win this for myself to track my running better! I am trying to run some 5Ks this year and I think this would help me to improve. I ran in one a couple of months ago and placed 2nd. So I can get in shape! I would love something easy like this to track my miles. It would motivate me to stay on track and push myself to get better and stronger. My husband would love this for when he goes walking! My husband would ❤️ This for training for his first marathon!! I registered to run a marathon this fall so I really could use this!! This would be great since I run. I should win because I'm a runner. I am training for my first half marathon and I would love to be able to track my runs with this! 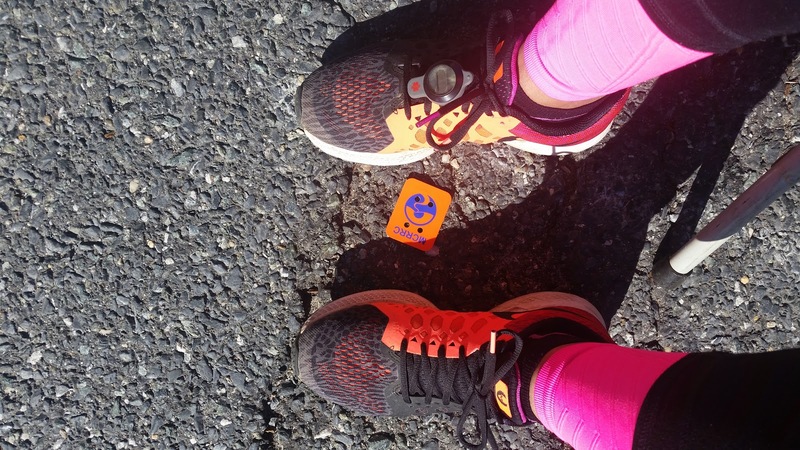 I should win because if I did, I'd waste no time putting it on my shoes for a run! My hubby and I have a summer challenge to get fit! We would love to win this! So awesome that you do runs like that- I have never competed in a race and I would be terrified, lol. I would love this because I don't own anything like it and I think it would be very beneficial to me! I need this in my life! I had my 3rd baby girl (and probably the last) mid April and I'm so ready to get back into shape. I think it what I need to get me headed back to the old me. I want to win because I want to time myself on the track. I am a long distance backpacking and my daughter is getting me in to running. Very different, and I can use all the help I can get. i would love to use this when i hike. i want to be more active. I started my weightloss journey a month ago weighing in at 308. I've lost 30 pounds but have more than 100 more to go. I would love to have something to track all my effort. I'm returning to running after taking time off from injury. I find that data is a great motivator. I sprained my left ankle pretty badly yesterday (while just walking in my yard...I'm a klutz) and I don't want to let this injury get me into a pattern of using it as an excuse after it heals to not keep moving. Running has become such a big part of my life. I use it to inspire myself, and hopefully others. It's what keeps me going. And, now, I'm entering the training session of a lifetime. I have been working hard and finished my first half, recently, and now getting ready to start training for my new PR and a Spartan Race. I am new to running and this would really help me to keep going.. I would love the Milestone Pod to help track the distance and steps that I walk on a daily basis. I would love this because once I have this baby, which is soon, i would love some motivation to help me get back on track! my friend would love this. she completed her 100th half marathon last week but just lost her father so she needs motivation to keep going. I would like to win this to help track my miles. I have seriously started running and walking for health reasons and this would me reach my goal.